Vacation rentals have grown in popularity as an alternative to hotels. They can offer more space for your dollar, kitchen facilities, and the ability to accommodate larger families and groups. But with so many booking sites on the internet, it’s hard to know where to look and what to look for. Here’s what you can expect from the top vacation rental sites — all great places to start your search. Rent vacation homes, condos and apartments directly from their owners through websites such as HomeAway, FlipKey, VRBO and Airbnb. On the other hand, aggregator sites such as Tripping, AlltheRooms and Booking allow you to see options from multiple sites at once so you can compare options. If you’re just starting your search, an aggregator site is the best place to start. You’ll have a wider range of choices to start from, giving you a better shot at finding your preferred vacation rental. Most sites work using similar methodology. You begin by entering your preferred dates, location, the number of people staying or beds needed and price range. Additional filters may be available for amenities like Wi-Fi, laundry facilities, a grill, air conditioning or a pool. To achieve the best results, narrow your search with as many filtering options as you can and then let the site do the work for you, using algorithms to bring up choices based on your qualifications. The most common fear among people booking a house online is that they’re not going to get what they expect, said Jen O’Neal, founder and CEO of Tripping. At a hotel, most amenities are standard, no matter where you go. 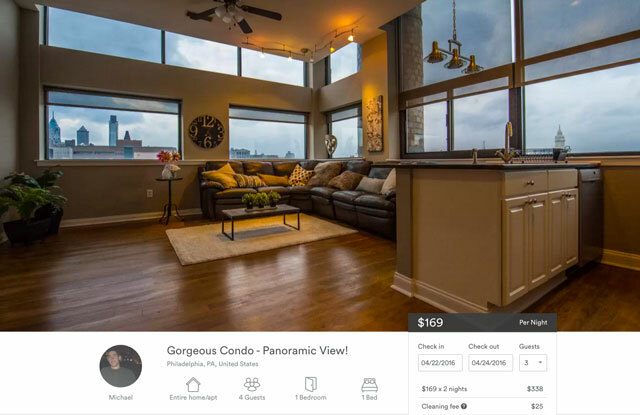 But a vacation rental is a unique property, and renters worry that photographs online might not be true representations of what they’ll see when they arrive or property descriptions might be inaccurate or misleading. When a property description says “near the bustling activity of the harbor,” does that mean you’ll have a charming view of the ships coming in, or will you be awakened each morning at 6 a.m. by the noise of the fishing boats and fishermen unloading their catch? Read the fine print. Even though websites will help you narrow your focus, you still need to do your own research — that is, read the descriptions of the properties carefully. Owners often write a lot about the property and the surrounding area. Look to see if the listing contains thorough online descriptions. If something seems odd, don’t book it. Go with your gut. Look at the photos. Photographs can also be a giveaway. If a property only has two photos posted online, for instance, think hard before booking. Sites that offer high-resolution photos in larger quantities and of multiple rooms, (seven different shots of the kitchen doesn’t count) are usually better at helping you gain confidence. Read the reviews. Look for properties with multiple reviews, especially if they’ve been renting for multiple years. Check for specific references and mentions (“What a nice touch it was that the owners left a bottle of local wine for us upon our arrival!”) and details like names of the owners (“Susan, I loved renting your home. It was charming.”). If the names don’t match the name of the person renting to you, that could be a red flag. Learn the local law. In the United States, some spots have regulations prohibiting rentals of residential properties for terms shorter than a month. (These stem from concerns including safety and loss of hotel tax revenue in the area.) Owners who violate those statutes could be prosecuted, so be cautious. You don’t want to find yourself caught in the middle of legal problems later on. Call the owner or manager. Before shelling out any money online, if you have unanswered questions, call the phone number on the listing and ask to speak with the owner or manager directly. No number? Look for an email instead. If neither of these are available, contact customer service for the website you’re using to see what they can do to help make a connection. If it’s too difficult to reach someone associated with the property, consider it a sign that you shouldn’t be renting that listing. Check out the owner online. Check online to see what kind of online profile the owner or manager of the property has. LinkedIn, Google, Facebook, Twitter, Pinterest and other sites let you play sleuth. Check that information is consistent across the board. They may be checking you out as well! Protect your payment. Just as you would with other online purchases, be smart about online payments. Your best bet is to pay by credit card. It allows for a paper trail in the event that something goes wrong and come with some protections mandated by law. Avoid paying in advance with cash or a cash equivalent. Some properties may still ask you to show up with a check in hand, and that’s okay, but if someone asks you to wire money from Western Union or send a money order in advance, it could be a scam. 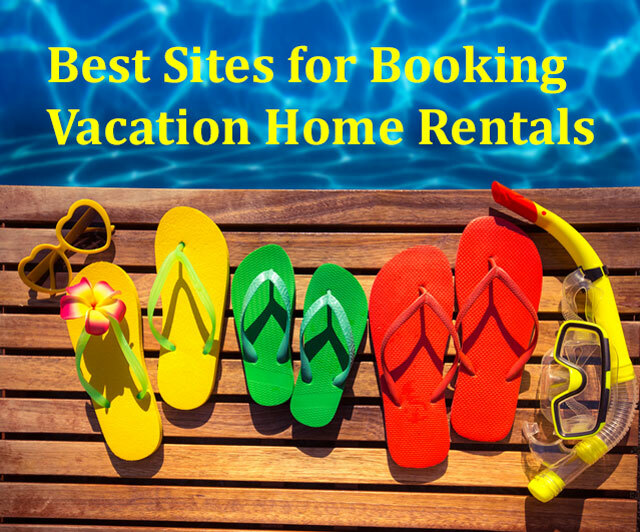 Our favorite vacation rental sites have all been around for a while, are well-regarded in the industry and are competitive with real estate, meaning you’ll find a larger selection of offerings. You’ll find options from around the world with rentals for vacationers on a budget to those who ready to splurge on real luxury. These services employ vetting procedures for owners, encourage reviews and offer customer service and secure payment options as well as some optional guarantee programs. 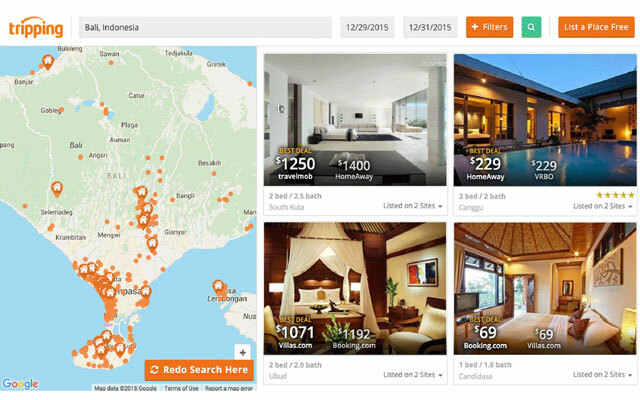 With more than 8 million rentals in 150,000 destinations worldwide, Tripping.com is considered the largest search engine specializing in vacation rentals. Its mission is to save you time and money by comparing properties from top rental sites around the world. Here at this meta-site, you’ll filter properties by location, price range, number of guests and bedrooms and a large list of amenities. An initial search for rentals in Little Compton, Rhode Island, netted 181 potential rentals with my filtered qualifications in or very near Little Compton in about three seconds. (Little Compton is an area in which it can be hard to find private rentals.) Two other aggregator sites netted 136 and 124 listings, but none were actually in Little Compton, and a good number were hotels or motels. Tripping.com properties came up in easy-to-read thumbnail composites. Properties listed on multiple sites display up to three sites at a time along with pricing from each site. Compare listings to find the least expensive choice. O’Neal says Tripping.com doesn’t typically favor particular partner services but does use a “relevancy algorithm” that takes into account property availability, the “freshness” of the listing (has the calendar been updated? ), photo quality, the length of property description and the number of good reviews. Once you’ve chosen a property to look into further, Tripping.com redirects you to the site holding the listing for your booking. One of the biggest trends in online vacation rentals, O’Neal says, is the shift towards instant bookings that are as quick and easy to make online as a hotel room. More than 2 million properties on Tripping.com are instantly bookable. Be sure to read any and all details, look through all the pictures and review any policies listed. HomeAway.com is considered one of the leaders in the online marketplace for vacation rentals, with 11 other successful vacation rental sites including VacationRentals.com, VRBO (focusing on U.S. rentals), Travelmob (specializing in sites in Asia) and Stayz (with a concentration on Australian properties). It’s a massive site that gives you plenty of traditional private vacation homes to choose from. Filter your search by date, budget, number of people and amenities (pet-friendly, Jacuzzis). In addition to large number of listings in the United States, HomeAway has plenty to choose from in Europe too. When I searched for a rental for an upcoming visit to Washington, D.C., I found a number of apartments and condos just blocks from major monuments. If you want to indulge a bit of celebrity fantasy, HomeAway offers the chance to rent homes previously belonging to stars, like Elizabeth Taylor’s Palm Springs home or Frank Sinatra’s Twin Palms Estate. 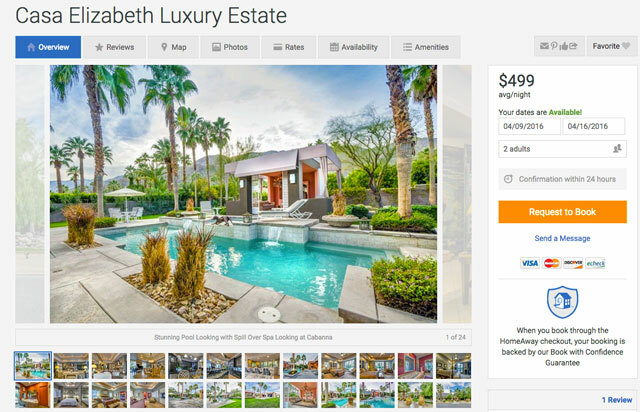 HomeAway provides many clear photos on listings and readily available information about owners. For instance, I learned that Eva, the owner of a one-bedroom apartment, is originally from Prague, speaks English and Czech and purchased the condo in 2009. She and her two boys spend every weekend at a museum, and she’s traveled extensively around the world. A phone number where I could reach her was just above her bio. HomeAway allows you to pay by credit card or PayPal. HomeAway suggests using HomeAway Payments — it’s the preferred transaction method. Payments made through this method are guaranteed up to $10,000 against internet fraud. A free mobile app for HomeAway lets you communicate with your rental owner, access details about your stay (What’s the Wi-Fi code? How do I get to the nearest grocery store?) and write reviews. HomeAway’s review system does not allow owners or managers to hide negative reviews or opt out of reviews, although they may post one response for each review, letting you get a further feel for their working style. FlipKey, which was acquired by TripAdvisor in 2008, features more than 300,0000 vacation homes and rooms in 11,000 cities globally. This site is chock-full of photographs in an easy-to-read format. Narrow down your search to properties that have been ranked using TripAdvisor’s five-star review system. A click on the ranking in the upper corner of the listing takes you to the reviews about the property and experiences from the travelers who’ve stayed there. 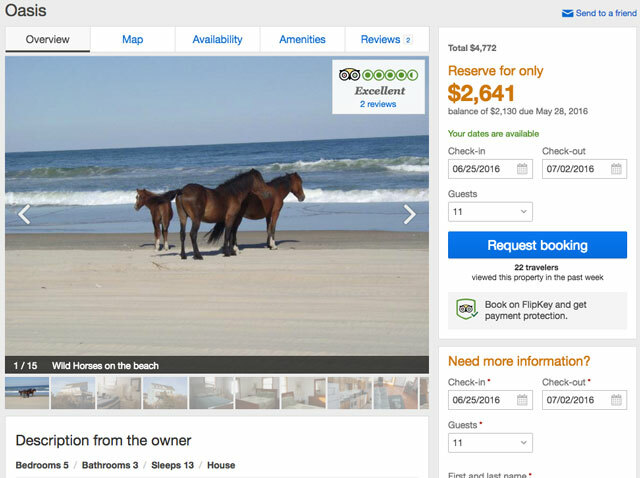 As I searched for a beach property in the Outer Banks, I quickly found not only a kid-friendly oceanfront location that could sleep up to 14 (we needed up to 11), but I saw that it led to a beach that was part of a wild horse sanctuary. The kids would be delighted to witness horses roaming free along the beach. Reviews from travelers who’d stayed there reinforced both the photos and description of the property and amenities. Search through categories including adventure, beach, city, popular destinations, most reviewed and top rated. Virtual tours of chosen cities in the United States and abroad let you flip through a Google Street View-style picture tour. FlipKey offers TripAdvisor Payment Protection up to $10,000, providing a refund if you’re prevented from accessing your rental at check-in or the property was misrepresented (“differing substantially to what was advertised”). Make sure to read the fine print so you understand when it does or does not apply; for instance, minor differences in the location, availability of local attractions and maintenance issues with amenities are not covered. At more than 2 million properties worldwide with hosts in 190 countries and more than 34,000 cities, Airbnb.com is one of the largest vacation rental sites today. While it made its name for travel on a budget, you’ll find a wide variety of rentals on Airbnb, from couch to castle. The majority of Airbnb listings are private homes (or portions of their homes). It’s up to you whether you want to rent a private or shared room or an entire place. Airbnb typically works at the peer-to-peer level, as opposed to vacation homes or managed properties that are professionally managed. The focus is often on urban destinations; think New York, London, Paris. Listing photos, host profiles, and reviews will help you make your decision. Filters allow you to narrow your choices by location, type of accommodation (yacht, anyone?) and price. You’ll fill out a profile to let the host know more about the type of guest you are, then either request to book the space or, in some cases, make an instant booking that allows you to confirm your stay immediately. I like the idea of having a host who can realistically advise you about the local area. It’s a bit like having a live-in concierge. If you hate this idea, check with the owner to see if they’ll be around while you’re there or not. Airbnb is laid out with clear photos and corresponding locations on maps to give you a bird’s-eye view of how close a location may really be to the places you’re visiting. Additional fees such as cleaning fees, service fees and taxes are labeled and transparent. I could also see that 26 other people were looking at the same apartment I was eyeing for the dates I’d need to be there. I also liked a clear link from the page to a guidebook to Philadelphia that gave me plenty of suggestions of things to do. I’m from Philadelphia, but I learned a few new recommendations for bars and nightlife, with descriptions that enticed me to check them out when I’m in town next. Guests have the ability to review hosts and vice versa, and Airbnb doesn’t pay the host until 24 hours after check-in, a concept in place to help to ensure a smoother stay. Airbnb provides a 24-hour emergency line and a customer service team to help out in the event you have an issue. That said, booking through Airbnb does not come with the kind of monetary guarantees found on other sites, and you’re advised to read everything you can on the site and contact the owner or Airbnb representatives with any questions prior to booking. Airbnb does have a guest refund policy and will take extenuating circumstances into consideration for cancellations (either from the host or you as the guest), including death in the family, serious illness, natural disasters and more. Booking your vacation can mean a lot of time-consuming research. While no website is perfect, at least not that I’ve experienced, using online sites to book your vacation rental properties frees up more time for looking into other aspects of your time away from home. What sites have you booked through online with success? Please share with us! This article fails to point out that most of the big vacation rental sites are now charging sizable and in some cases outlandish booking fees to travellers (in addition to deducting fees from owners on every rental). If you’re willing to spend a little extra time hunting down owner websites, you can save a bundle. What the big sites claim to offer in “protection” is in many cases little more than what your credit card company may offer, and sometimes less. In addition to the comment I posted previoulsy, I want to add that most of the big booking sites are now blocking all contact information between owner and renter until and unless they are booked on their sites. This makes advance vetting of renter or owner/property impossible. My husband and I have four kids, and we’d like to be able to find a place to stay for our next vacation where we’ll all fit. Your tip to make sure you carefully read the property descriptions is very sound. We’d definitely be able to find one that’d fit all of us. We’ll have to use your tips to find something to rent. I’m glad that you talked about vacation home rentals. I like that you mentioned reading the reviews, next time we’ll be having a vacation I’ll make sure to check the names of the owners. Cheers!